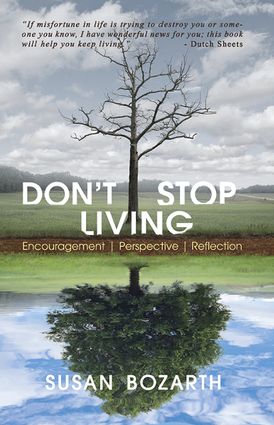 Don't Stop Living is a book of short stories and personal illustrations to share how God has walked with me through the challenges, traumas and dramas of life. God does not have favorites... if He walked with me, He'll walk with you. He'll not only walk with you, but talk with you as well, and bring soothing words of comfort and challenging words of overcoming. Now is not the time to give up on life! Regardless of the difficult situations you may be facing today, God is still in control and desires for you to find fresh vision and hope for the life that is still ahead. ​Peggy gave me your book "Don't Stop Living" and I couldn't put it down! I was fed spiritually and mentally. The book was so encouraging and inspiring. I showed it to my therapist and she was thrilled as she went through it. The words that meant the most to me were "You are not alone, other women have walked exactly what you have." So, I thank you. Thank you so much for writing such a wonderful book on experience and truth. The verses from the Bible totally blessed me.